Lucas Dupin (b. 1985) is a Brazilian visual artist with an MA in Fine Art from the School of Fine Arts of the Federal University of Minas Gerais, Brazil, and a BFA from the same University. Looking at the portfolio pages on Dupin’s website it’s clear to see that he’s an artist with an active interest in creating site-specific interventions in public spaces, both indoor and outdoor, in addition to exhibiting in traditional gallery spaces. 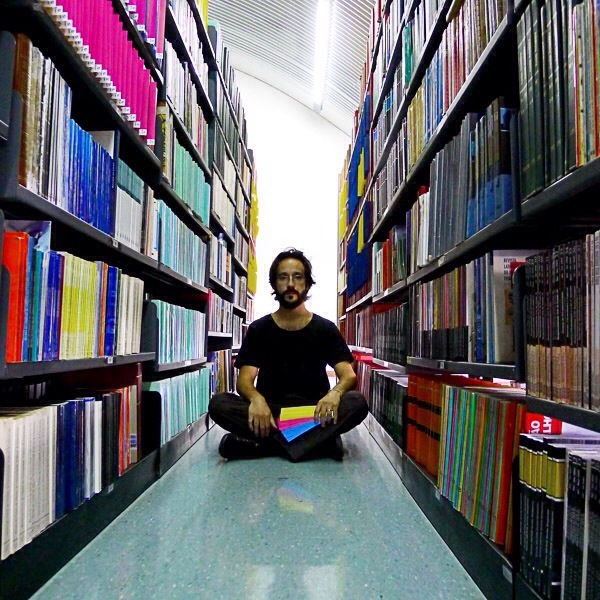 Combine this penchant for public engagement with a deep-rooted interest in bookbinding and literature that runs alongside his practice, and it’s not surprising to find that this Brazilian artist has found himself in Oxford with an exhibition at the city’s central library. 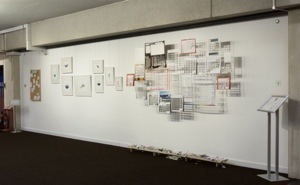 The space of literature comprises two new works, a wall-based installation and a series of watercolours. The work derives its title from a book by the French writer Maurice Blanchot. 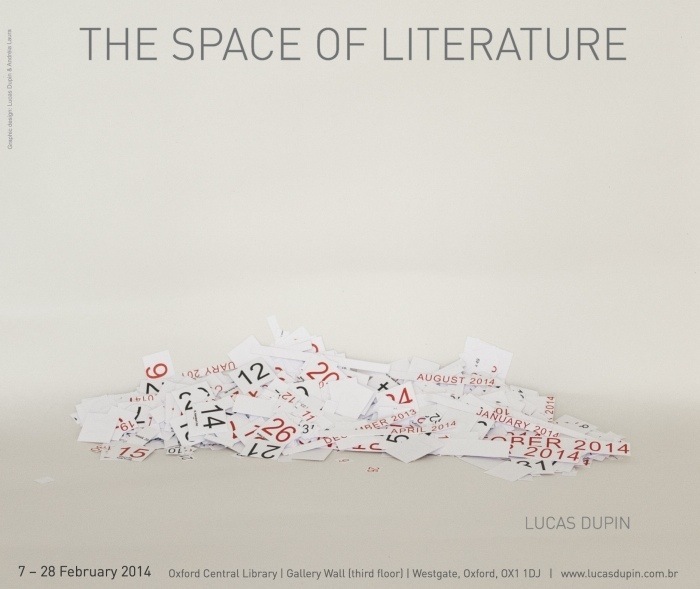 Despite its connection to the literary practice, Dupin’s artworks invites the viewer to enter into an experience, to explore an understanding of a place where time and space are absent. Dupin is interested in creating transportative experiences that enable the viewer to enter a space where one belongs to the imagination. 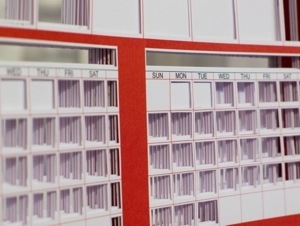 Deconstructing everyday objects, Dupin’s installation at Oxford Central Library comprises of a group of old calendars where all numeric or time references are cut out. 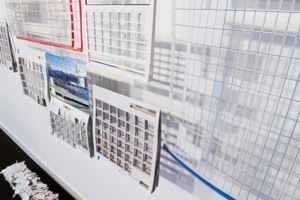 What remains, hanging on the wall, is a geometrical patterns of grids, the left over spaces of the days plus the missing parts strewn across the floor. The other other work is a set of displaced watercolours. The paintings evoke a space of strangeness where time and space seem to be suspended. 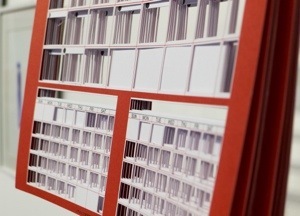 Lucas Dupin has worked with bookbinding since 2005, developing books, and teaching courses. In 2009 he won 2nd place in the ABER (Brazilian Association of Bookbinding and Restoration) contest in the amateur category with an exhibition at São Paulo Cultural Center. He also conducted a short internship at Atelier Reliures Houdart in Paris under the guidance of Ana Utsch in 2008. 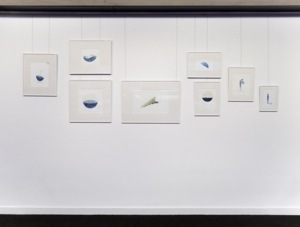 Dupin’s work has been exhibited and featured in several solo and group exhibitions in Brazil, Canada and USA. Two years ago, he won the Energias da arte Prize, an important national award focused to young artists. As part of the prize he joined an artistic residency at The Banff Centre in Canada for two months. Other highlights in his curriculum are the prizes Forestry Interactions (2010) with an artistic residency at Terra UNA Eco Village and the competition and exhibition Olheiro da arte in Rio de Janeiro. 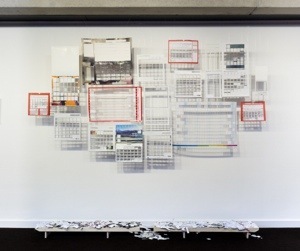 This entry was posted in Worth a Look and tagged art, Brazilian artist, exhibition, intervention, Lucas Dupin, Oxford, Oxford Central Library. Bookmark the permalink.